By now you probably have heard that a massive typhoon hit the Philippines last Friday. Named Haiyan (or Yolanda), the typhoon is reportedly the strongest ever recorded in history, with winds of 195 miles per hour and gusts up to 235 mph. Early reports coming out of the country say that as many as 10,000 people lost their lives. Countless more are reeling from the devastation in the storm’s deadly aftermath. Although the rescue and recovery efforts are starting in earnest, the storm only compounds problems already existent in the Philippines. Just less than a month ago, the country suffered from a 7.2 magnitude earthquake in Bohol. Additionally, the Filipino government recently has been trying to quell an Islamic-separatist uprising led by the Moro National Liberation Front (MNLF) in the southern part of the country, particularly affecting Zamboanga City in Mindanao. Although we must stand in solidarity with any peoples affected by disaster and devastation, I think Catholics in particular should acutely respond to the needs of our Filipino brethren. As a predominantly Catholic country, the gift of that nation to the treasured heritage of the Church has been immeasurable. For example, when persecutors asked him, “If we grant you life, will you renounce your faith?,” Lorenzo responded: “That I will never do, because I am a Christian, and I shall die for God, and for him I will give many thousands of lives if I had them. 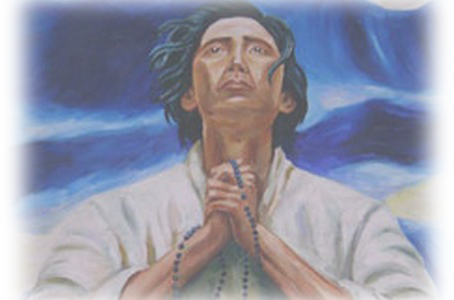 And so, do with me as you please.” Although the Filipino people suffered much tumult in the past few centuries, with the nation changing hands multiple times and occupied by various conquerors, they have continued to bless the Church with rich examples of family life, many priests and missionaries, sisters and brothers, and even a few canonized saints. Therefore, as they are in their need again now, let the Church universal respond in kind. As St. Paul tells us, “If part [of the body of Christ] suffers, all the parts suffer with it; if one part is honored, all the parts share its joy” (1 Corinthians 12: 26). Furthermore, he writes in the Epistle to the Galatians, “Bear one another’s burdens, and so you will fulfill the law of Christ” (6:2). Of course, sometimes when disaster strikes, and especially when it is on such a great magnitude, helping to make a difference seems impossible. We feel so powerless, do we not? But, through our faith, we know that this is not so. Blessed Mother Teresa tells us, while working amidst the unbearable poverty and seemingly limitless human needs in the slums of Calcutta, “If you can’t feed a hundred people, feed just one.” Everyone in the Church, in our own way, can do something. What, then, can these be? I offer two practical “beginning” steps. Prayer is the unshakeable foundation of a peace, a consolation, and a hope that the world cannot give. Indeed, the bishops of the Philippines, when faced with the impending storm, called upon all the people and priests to pray. Archbishop Jose Palma, President of the Catholic Bishops’ Conference of the Philippines, reiterated this with a call today for a novena prayer and charity. For them, it was natural because “Filipinos seek God and take it as a part of life. They do not curse God; rather they ask help from God, and spiritual help from the Church.” What faith this is! How much this world can learn from a suffering people following a suffering God who still choose to pray. Secondly, although we begin with prayer, we cannot end with prayer if it is within our power to do more. Our faith naturally must incarnate itself into concrete acts of charity. As St. James tells us, “I will demonstrate my faith to you from my works” (James 2:18). That is, our faith should be translated into real-world solidarity. It should express itself in love. Thus, Pope Francis also encouraged us to reach out to those affected with practical help. Although not everyone can be a relief-worker or join a humanitarian mission, what we can do is support organizations that do that type of work. As one of the largest charitable and humanitarian organizations in the world, the Catholic Church does much in the area of disaster-relief. I learned earlier this weekend from the Catholic News Service that two Catholic groups are currently accepting donations: Caritas Internationalis, the Vatican-based international network of Catholic agencies, and Catholic Relief Services, a Caritas network member in the United States. CNN also has compiled a helpful list of other organizations participating in the relief efforts. Supporting them is a concrete way now to get much needed help on the ground with the first-responders. We know that money cannot ever replace the lives lost. It cannot make whole the anguish and suffering borne by the Filipino people. But it can help them in small ways to get their lives back together, to have a filling meal, a dry change of clothes, or to simply find warm shelter for the night. Although the saints never forgot, nor can we, that love and closeness are what people most yearn for, these can be some of the many ways that we show our love. In whatever way you are called to give of yourself, let us imitate St. Lorenzo and his companions. And although we, like him, may wish it so, we do not have thousands of lives to give to Christ; but we do have one and that is enough.